Glad you brought this up for discussion! I was actually thinking that going to an unlimited music model was just an awful idea for Apple, and it would have eventually killed the iPod. 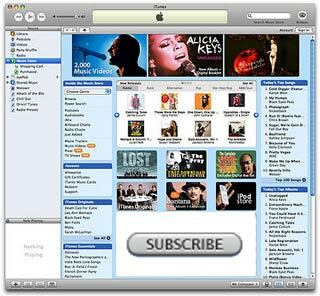 There is no way that it would have included the full iTunes library, only a limited selection (see Napster for an example), and it would have certainly driven up the cost of Apple products. I’m glad this was just a drunken rumor, because it would have forced artists to eventually look elsewhere or go independent when publishing their music. iTunes is a fantastic service as long as it remains simple, cheap, and works for both the artist and consumer. $.99 per track or less is just fine, and if it ain’t broke don’t fix it.